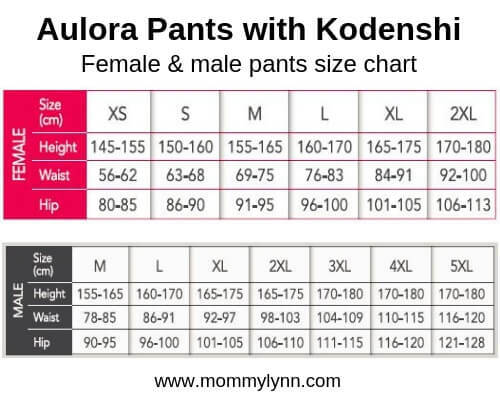 Aulora Pants With Kodenshi Review – Does The Pants Work? For women, one of the biggest challenge is to stay slim. If you have given birth, it is very difficult to get back your body figure before you had your child. I am a mother with 2 daughters age 5 and 7 years old. To stay slim, I have tried dieting and exercise program but the results were not very encouraging. Some background about myself. I am a full-time mother. Because of my motherly responsibilities at home, such as sending my daughters to school in the morning and fetching them back from school in the afternoon, cooking, cleaning and many more, I don’t really have much free time to exercise. Apart from that, I also had constant back and shoulder pain from breastfeeding my youngest daughter. I breastfed my youngest daughter for more than 36 months. Because of the breastfeeding position and me constantly carrying my daughter, I had developed a chronic lower and upper back pain. 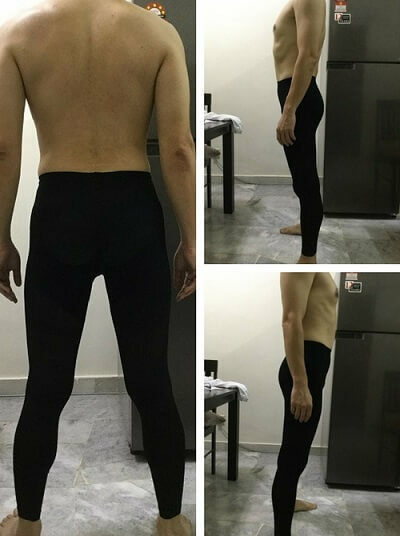 OK, I am having constant back pain and I also would like to slim down but I don’t have the time to exercise, is there a solution which can solve my problems? Luckily there is…it is the new health and wellness slimming pants that uses far infrared rays (FIR) technology from Japan known as Aulora Pants with Kodenshi. In this article, I would like to share my personal experience wearing the pants. The picture below is me wearing the black colour Aulora Pants. NEW! – Click the link below to message me on WhatsApp because there is currently a promotion on the Aulora Pants for April 2019. In this section, I will share some information about the Aulora Pants. Firstly, the pants is fully designed and made in Japan. The sole importer of the pants into Malaysia and Singapore is BE International Marketing Sdn Bhd located in Shah Alam, Selangor. How can the pants help you to slim down? How does the Aulora Pants work to help you to slim down without dieting and exercise? To answer the above question, I would have to share with you the science of far infrared rays or FIR. The Aulora Pants material is made using the state-of-the-art fabric technology known as Kodenshi from Japan. In the manufacturing process of the Kodenshi cloth, high purity and ultra-fine ceramics particle are integrated in the fiber. Ceramic stones, being a natural material will emit far infrared rays (FIR) when it is heated. The FIR is safe and natural and it has the ability to penetrate deep into our skin. What is the energy source for the Kodenshi fabric? How is it heated? 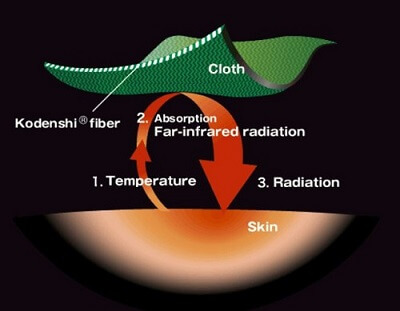 The energy source used to heat up the fine ceramic particles in the Kodenshi material is our own body heat. When the Aulora Pants material touches your skin, it will absorbs your body heat and the ceramic in the fiber will emit the far infrared rays. One of the benefits of FIR is its ability to improve your blood circulation. When you have better blood circulation in your body, it will enable your body to burn fats and calories faster. When your body is burning fats and calories faster, it will lead to higher body metabolic rate which will lead to slimming effect after some time. That is how you will experience slimming effect wearing the Aulora Pants without having to change your daily diet or exercising. Proper blood circulation is a fundamental feature of good health. Natural therapies like far infrared ray (FIR) have been shown to have significant benefits for the circulatory system. With Japanese ergonomics technology, weaving from bottom to top to lift up and push up muscles. The body looks slimmer and allows flexible body movement. Lift, lock and secure body fats to create a sculpted body curve like lifting buttock and have longer slimmer legs. It is thin, breathable and smooth. No rustle as you move and you can wear it all day long without any discomfort. The pants material is soft and comfortable, sweat evaporates quickly. Efficient and high quality imported product. Value for money compared with any branded exercise garment. Easy to match with working and casual outfit, and can be worn during exercise to minimise muscle pain after exercise. Does the slimming pants really work? I believe the main question you would like to know is, does it work? Can the pants really help you to slim down without much effort? From my personal experience, I can confidently say, yes it does work. When I first got the pants, I wore it for 14 days straight, day and night. 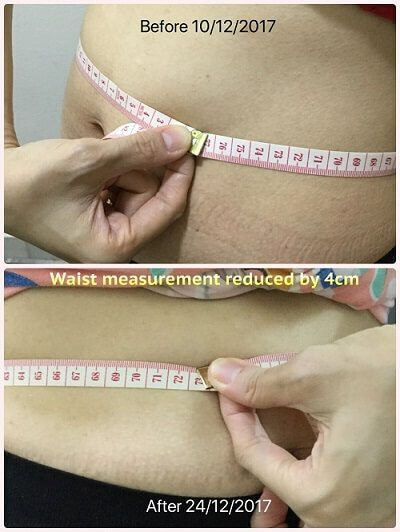 After 2 weeks of wearing the pants, my waist measurement reduced by 3.5 cm. My back and shoulder pain are also gone. I did not change my diet and neither did I do any exercise. I just do my regular daily routine at home while wearing the pants. Below are some of my before and after pictures. 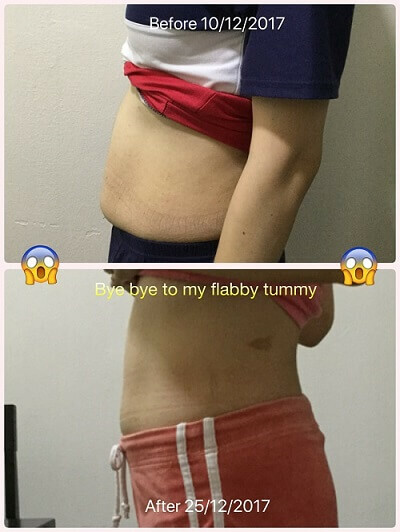 Update: When I started wearing the slimming and wellness pants, my waist was 76.5 cm then after two weeks, my waist was 72.5 cm. I didn’t measure until up to date (May 2018), my waist measurement is reduced to 69 cm! Will the pants work for you? To be honest, I am not able to answer you. Although I’ve personally experienced positive results wearing the pants, it may or may not work for you. All our bodies are different because we have different body type, different lifestyle and different level of metabolism. Nonetheless, the only way to know for sure is to try it. Do you know the compression pants from Japan is also suitable for men? Although the product brochure shows a picture of a woman, the pants is actually suitable for men as well. Back in April 2018, my husband asked me to get a pair of the legging for him to wear. Slimming is not his priority. He wanted to relieve his stiff neck and shoulder muscle from sitting in front of the computer for too long everyday. Sometime, his stiff muscle is so bad he’ll have migraine at night. He wore the pants and within 2 days, no more stiff neck and shoulder. Update: As of mid July 2018, a new pants design for men has been launched. The pants design for men is slightly thicker compared to women. Thank you for visiting my blog. I hope my sharing on my personal experience wearing the Aulora Pants has been helpful for you. ACT NOW! – Click the link below to message me on WhatsApp because there is currently a promotion on the Aulora Pants in April 2019. Is the pants really made in Japan or is the material is the one made and imported from Japan? I googled and only found that fiber material is a Japan technology. Can’t find any part of Japan selling this pants. Hi Evelyn, the reason you can’t find the pants in Japan is because it is custom made for Malaysia and Singapore market. There are other similar garment in Japan such as bra, winter jacket, gloves, sock etc. The slimming pants from Japan that I’ve tried has the highest percentage of fiber that emits far infrared rays which is over 88%. Other similar garment has less than that. The popularity of the Japanese slimming leggings has now spread to Brunei, Hong Kong, Australia and also New Zealand. It’s exciting to read your review on the slimming pants. Will it give the same results it i just wear it during the day only? Hi Mama Ween, thanks for visiting my blog. Yes, you will experience slimming results if you wear the slimming and wellness pants during the day. Recommended to wear at least 8 hours a day. Hi Adeline, please send a WhatsApp message to my number above and I will get in touch with you. 1) Is this suitable for old man/woman? 2) having high blood pressure can wear or not? Hi Nelson, the pants is suitable to be worn by both old man and woman. It is especially effective to relieve joints and muscle pain. If the person has high blood pressure, it is recommended to wear the pants for a shorter period of time. Start with only 1 hour a day and slowly increase the wear duration. Hi Wendy, it depends on your wound healing. You can wear the pants 3 – 4 weeks after your c-section. Hi Lynn, must it be for a straight 8 hours of wearing or can be on and off as long as within a day, 8 hours including sleeping time?Can it be worn to sleep? because if I am to wear for an hour of intensive exercise which there will be a lot of sweat, then I will have to remove it, therefore no able to achieve the 8 hours. Kindly assist to advise and thank you. Hi Mrs Sim, you don’t really have to wear the pants 8 hours a day straight. It can be worn on and off. Nowadays, I usually wear it during sleep. Obviously, if you wear it during day time, the effect is better because you are moving around and your blood flow is faster. Your movement also assist the compression element of the pants to tighten your body into the desired shape. Most important, you have to drink lots of water when you are wearing the pants. I have been wearing the pant for about 1month. I saw the effect is good but why my body aching and my feet is pain.I don’t have this pain before wearing the pant. And the pant is getting loose.I love this pant because it make skin texture better and i have lost 2 inches. I wore 22hrs per day . Hi Mia Ali, I do have customers that experienced body aches and feet pain after wearing the pants. This is common and most probably is due to your lymphatic system blockage. The lymphatic system is a network of tissues and organs that help to remove toxins, waste and other unwanted materials from your body. What you can do is to drink lots of water so the lymph fluid can flow smoothly. Also reduce the pants wear duration down to only 3 hours a day. If you feel fine, slowly increase your wear duration to 4 hour, 6 hours etc. The goal is to increase your wear duration slowly so your body can adjust to the increased blood flow. Hi Lynn, I have tried the pants and is in love with it. Although I didn’t wear it Everyday, I do notice my tummy was getting flatter! Recently the pants got a thread sticking out…. how can I fix it? Hi Jasmyn, thanks for your feedback. Glad that you are seeing some positive results wearing the pants. If there is a white thread sticking out, it is the rubber elastic material. Leave it as it is. If it is a black thread, that is a Kodenshi thread. Leave it as it is also. DO NOT trim any of the thread. Your pants will work just fine. It will still emit the far infrared ray (FIR) when worn. My friend recommended the pants tome, but i have high blood pressure. So is it recommended? i am wearing the socks now during sleeping time, is it ok?